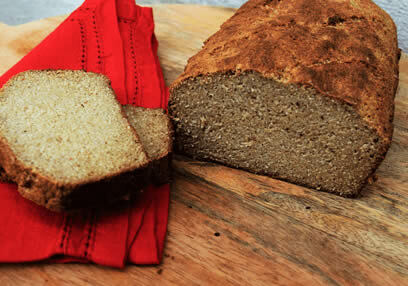 Try this delicious gluten free buckwheat & coconut bread from A. Vogel toasted or served with (dairy free) cream cheese. 1. Preheat the oven to 180°C and line or grease a loaf tin. 2. Combine the buckwheat flour, coconut flour, psyllium husks, baking soda and sea salt in a large bowl. 3. Make a well in the middle of the dry ingredients and pour in the eggs, vinegar, oil, honey and coconut milk and mix well. 4. Pour batter into your loaf tin.